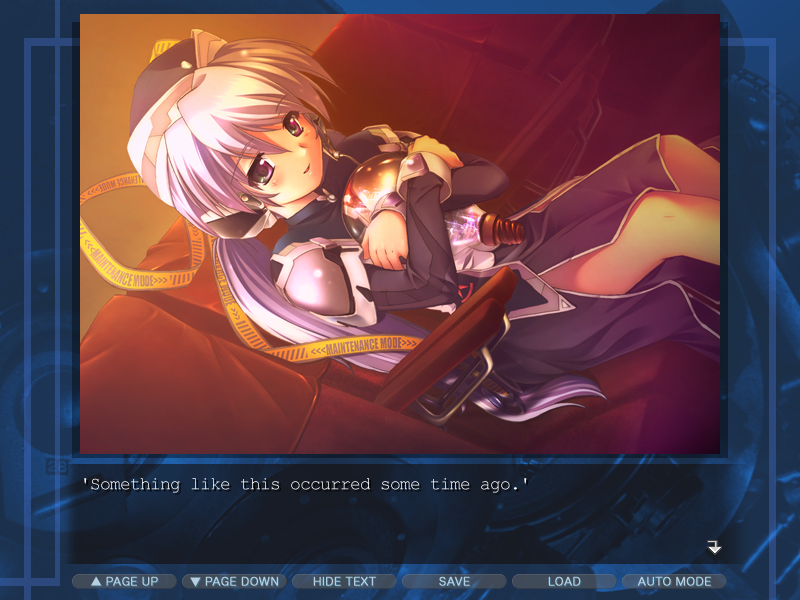 The above are all valid keywords and terms when describing the themes in the apocalyptic visual novel planetarian ~the reverie of a little planet~ by Japanese-developer Key – a kinetic novel fast approaching its 10th anniversary in November later this year. It is important to stress that this is not a game – nor is it an interactive novel, but rather a kinetic visual novel meaning that the player, unlike traditional visual novels, is given no choices in terms of how the story progresses. An approach which undeniably puts a lot of pressure on the story as it needs to be stellar and very solid to both entertain the player and justify the price. 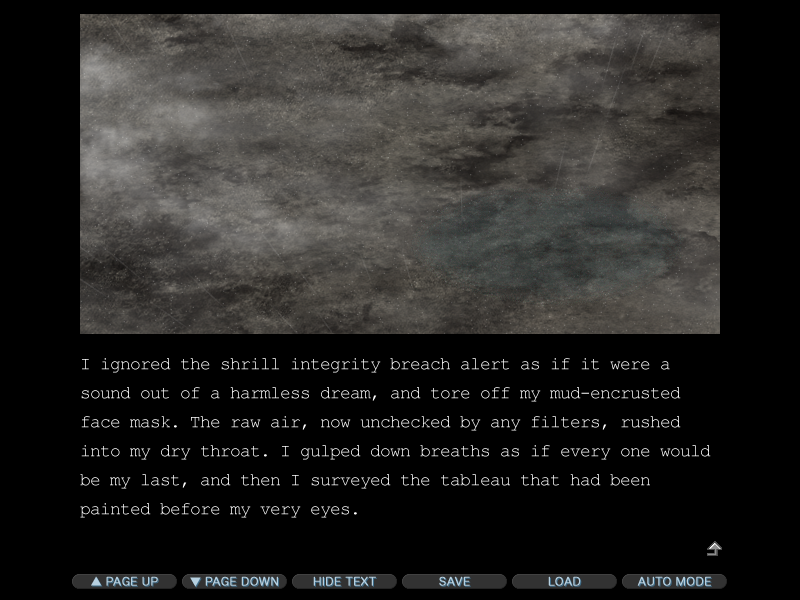 My review will thus primarily focus on the story and illustrations rather than the game mechanics. Though, it is important to remember that the game is nearly ten years old, and that the UI and resolution-options thus are limited and clunky due to that. The word is a ravaged wasteland which suffers from a consistent poisonous and corrosive rain – all a direct result of humanity’s warfare and inability to forgive and communicate properly. planetarian introduces the reader to the ravaged remains of an once magnificent and monumental civilization which, due to depletion of limited natural resources, overpopulation and a failed Space Exploration Project, has become the victim of its own biological- and nuclear warfare. Once started, the war wouldn’t end and the bloodshed continued for thirty rough and unforgiving years – well into an era dominated by automated war machines set to kill anyone trespassing their territory on sight and capable of withstanding the now poisonous rain. Whilst humanity remains present in small, unfriendly and very scattered groups, the story only includes one human-character; a middle-aged soldier and so-called junker (a person who enters dead cities on their own in an attempt to scavenge and track down valuable and undamaged objects) – simply referred to as ‘the junker’. Our main-character enters a derelict city and finds himself in the Flowercrest Department Store, where he unexpectedly is greeted by the ever talkative gynoid attendant, Yumeni. It quickly turns out that Yumeni is completely unaware of what have happened the previous 30 years as the databases she connects to are long gone. She thus welcomes the protagonist like a regular guest and refers to him as Mr. Customer, and proceeds as if nothing is wrong by showing massive loyalty and attentive while sharing happiness. There are only two characters throughout the entire story, one of them being the talkative robot, Hoshino Yumemi. In fact, Yumeni welcomes the junker as the store’s 2 500 000th visitor (despite him really being the 2 497 290th), and insists on showing him a special commemorative projection – an offer which he despite his aggravations accepts. Unfortunately the projector device, Miss Jena, is malfunctioning and the junker is required to repair it. As the junker works on the projector, he continues to observe and talk to Yumeni, whose innocence, amazing work ethic and almost childish happiness makes him grow fond of her. The above ultimately means that a great amount of the dialogues consist of pure small-talk – something which appears subtle at first, however, is the fact that the small-talk perhaps are the most important dialogues. They truly show the differences between the junker and Yumeni, and how the two of them are respectively born and created into two different worlds years apart. The illustrations are all very well-made with rich colours. As the story progresses, it is evident that writer Yūichi Suzumoto understands how to play with the reader’s emotions and how to create a unique setting for his story. Mixed with very appealing illustrations, music and dialogues the character development furthermore remains intriguing and charming. When that’s said, then planetarian ~the reverie of a little planet~ is not a game (or story) for everyone. A passion for anime is an absolutely minimum requirement, and an acceptance of the fact that there are no choices or interaction to be made beyond the dialogue speed. 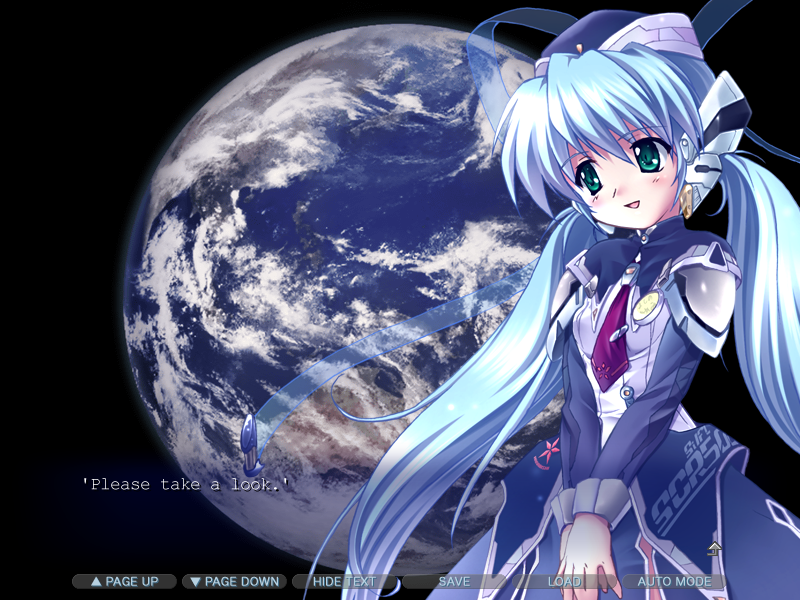 However, if you like anime and don’t mind a kinetic novel, then planetarian ~the reverie of a little planet~ is a great choice for an emotional and solid story. A press copy was kindly provided for reviewing purposes.